Custom designed North Shore home built in 2014 with incredible mountain views and close to Haleiwa town. Located on the picturesque Paalaa Road, this island-style home boasts brand new vinyl flooring, stainless steel appliances, solid wood cabinetry, beautiful white quartz counters, and a large covered lanai off the living room that frames the gorgeous mountain views. Covered parking/storage area below the home offers an excellent space to accommodate your ocean toys. Fenced parking for two cars also provided in front of the house. 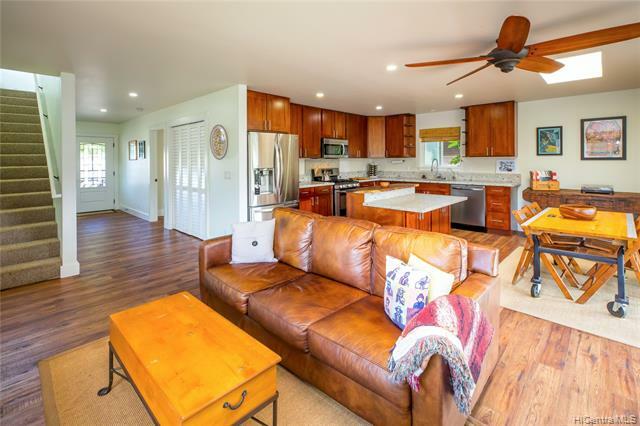 Gated, secure, and in very close proximity to world class surfing, beaches/parks, and the charming storefronts and great dining of historic Haleiwa town. Here\'s your chance to live the country lifestyle!